An investigation into H.P. Lovecraft and the invention of ancient astronauts. As seen in Skeptic magazine. The idea that extraterrestrials served as humanity's earliest deities came to popular attention with Swiss author Erich von Daniken's 1968 best-seller Chariots of the Gods and the influential 1973 NBC documentary In Search of Ancient Astronauts, based on that book. But for people familiar with the science fiction magazines of the 1940s and 50s, von Daniken's "revolutionary" assertion held more than just a hint of other writings that claimed long before that the gods were not of this world. In fact, much of von Daniken's case perfectly parallels the work of a certain New England writer of horror stories, and the route from horror story to nonfiction best-seller bounces us from America to France to Switzerland. Providence, Rhode Island author H.P. Lovecraft has been justly hailed as a master of the horror story, and his work claims a place beside Edgar Allan Poe and Stephen King in the pantheon of the genre. Born into a wealthy family in 1890, Lovecraft's life was a series of reverses and declines as his family lost their fortune and his parents succumbed to madness. He was precocious and self-taught scholar who read voraciously and devoured as much literature as he could read. He read the novels of H.G. Wells, whose War of the Worlds told of the coming of alien creatures to earth. He also read the eighteenth century Gothic masters of horror, and above all Edgar Allan Poe. When he set about writing his own works, he began to blend the modern world of science fiction with his favorite tales of Gothic gloom. Lovecraft tried to bring the Gothic tale into the twentieth century, modernizing the trappings of ancient horror for a new century of science. Lovecraft published his work in pulp fiction magazines, notably Weird Tales, though many of his works were not published until after his death in 1937. Throughout the 1940s and 1950s, science fiction and horror magazines reprinted Lovecraft's tales numerous times, and he became one of the most popular pulp authors. Lovecraft's works banished the supernatural by recasting it in materialist terms. He took the idea of a pantheon of ancient gods and made them a group of aliens who descended to earth in the distant past. There had been aeons when other Things ruled on the earth, and They had had great cities. Remains of Them . . . were still be found as Cyclopean stones on islands in the Pacific. They all died vast epochs of time before men came, but there were arts which could revive Them when the stars had come round again to the right positions in the cycle of eternity. They had, indeed, come themselves from the stars, and brought Their images with Them . Another quite fantastic discovery was the Great Idol [of Tiwanaku]. . . Again we have the contradiction between the superb quality and precision of the hundreds of symbols all over the idol and the primitive technique used for the building housing it . In fact, only one of von Daniken's major claims is missing from the "Cthulhu" story, that the ancient gods created mankind in their own image. Lovecraft has an answer for that, too. In his 1931 story "At the Mountains of Madness," explorers find an incomparably old city in Antarctica, and the sculptures on the walls tell a horrifying story of how the Old Ones created Earth’s lifeforms: "It was under the sea, at first for food and later for other purposes, that they first created earth life—using available substances according to long-known methods… It interested us to see in some of the very last and most decadent sculptures a shambling, primitive mammal, used sometimes for food and sometimes as an amusing buffoon by the land dwellers, whose vaguely simian and human foreshadowings were unmistakable" . The names of Lovecraft's alien gods, like Cthulhu, Yog-Sothoth, and Shub-Niggurath, began to crop up in other stories during Lovecraft's lifetime. Lovecraft himself started this practice by inserting these names, or variants on them, into stories he ghostwrote or revised for other authors. 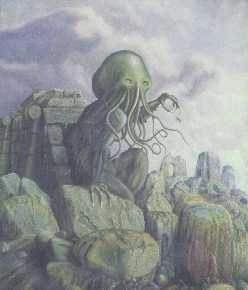 In his revision of Zelia Bishop’s "The Mound," for example, Lovecraft slipped his alien god Cthulhu into the story under the variant name Tulu, giving magazine readers what they thought were independent stories featuring references to the same ancient gods. By the 1960s, several dozen authors were using elements of what came to be called "The Cthulhu Mythos" in stories they wrote for science fiction and horror magazines. Lovecraftian fiction became increasingly popular in Europe, where the French embraced him as a bent genius, much as they embraced Edgar Allan Poe and would soon embrace Jerry Lewis. Lovecraft became especially popular with the French magazine Planète, which throughout the 1960s reprinted Lovecraft’s stories in French translation. Planète served as an important part of the French second science fiction period, a time when American pulp fiction became extremely popular in France following World War II . French magazines both imitated and reprinted in translation the classic pulp stories of the American 1930s and 40s pulp magazines. Planète's editors held Lovecraft as their prophet, and their reprints of his stories helped to popularize him and the Cthulhu Mythos in the French imagination. Lovecraft's longer fiction was published in French in a series of books. Lovecraft's work had also inspired the editors of Planète to write a book, Le Matin des Magiciens (The Morning of the Magicians) a few years earlier, in 1960. The book, by Louis Pawles and Jacques Bergier, first introduced Lovecraft's concept of alien gods as a nonfiction hypothesis. The authors claimed that their study of religions around the world had led them to higher consciousnesses and to new revelations about the lost worlds of the past. Especially relevant to this is Part One: Vanished Civilizations, where they heap up evidence backing up Lovecraft's fictional claims about alien super-civilizations of the past. Unfortunately now long out of print, the book Morning of the Magicians laid the foundation for all the lost civilizations books to follow, including Chariots of the Gods. As R.T. Gault comments, "It's all here, from the Piri Reis map to pyramidology. The authors are frankly fascinated by the idea that ancient peoples may have been more advanced in some of their technologies than we generally believe" . Von Daniken is known to have exploited this book as his major source. The bibliography of Chariots lists the book in its 1962 German translation: Aufbruch ins dritte Jahrtausend . Now we have come all the way from Providence to Paris to the Swiss hotel where von Daniken wrote his book, and we can see how Lovecraft's brilliant fictional conceit became a very real pseudoscientific nonfiction. Near the end of his life Lovecraft looked back on the growing body of alien god fiction that he and his friends had created: "This pooling of resources tends to build up quite a pseudo-convincing background of dark mythology, legendry, & bibiliography--though of course, none of us has the least wish to actually mislead readers" . Sadly, he did his work too well, and generations have now been misled by such authors as von Daniken. Lovecraft, H.P. 1982. The Best of H.P. Lovecraft: Bloodcurdling Tales of orror and the Macabre. Del Rey Books. New York, 88. Gault, R.T. 2000.The Quixotic Dialectical Metaphysical Manifesto: Morning of the Magicians. http://www.cafes.net/ditch/motm1.htm. Lovecraft, H.P. 2001. Quotes Regarding the Necronomicon from Lovecraft's Letters. www.hplovecraft.com. March 10, 2001. © 2004 Jason Colavito. All rights reserved.